Ahh, summer. Well almost. June is the beginning of many people’s favorite time of year. It’s a season full of bonfires, staying in the pool until you’re pruney, mouthwatering smells wafting over from the neighbor’s grill. When we spend hours out of doors and shut off the TVs and devote time to making memories with our family whether that be traveling together or going to the local festival. Know what else summer means? That’s what summer means for me! I use it to catch up on my always growing to-be-read pile. If I wake up early I sneak out to my deck and get in a chapter or two or five before the rest of the family wakes up. Now with the revolution that is digital reading, I always make sure my Kindle app is loaded up with new books for whenever I have a few spare minutes (like the grocery line … WHY is it always so long?!?). Confession: I don’t love hot weather and summer is not my favorite season (come quickly fall!). So as the temperature rises I love to travel via fiction to cooler spots—and Calhoune transports the reader to beautiful, breathtaking Alaska. Also, her heroes are the stuff dreams are made of. I flew through An Alaskan Wedding on a Saturday and immediately snapped up Alaskan Reunion and am avidly awaiting A Match Made in Alaska which releases in July! Get fancy this summer and spend time with royalty. Inspy Romance’s very own wonderful Carol swept me away to a world of kind princesses and a big hearted prince with her Montevaro Monarchy series. Who doesn’t love royal love stories!? I just noticed that Carol’s released the whole series in a bundle and it’s a total steal for all of the stories. Guys this one’s a contemporary twist on My Fair Lady and it’s simply delightful. Every character in the book, especially the hero—Reese—and his family, are so charming and fun. The book is both a feel-good and deep story that left me so happy at the end. This one is a great beach read. 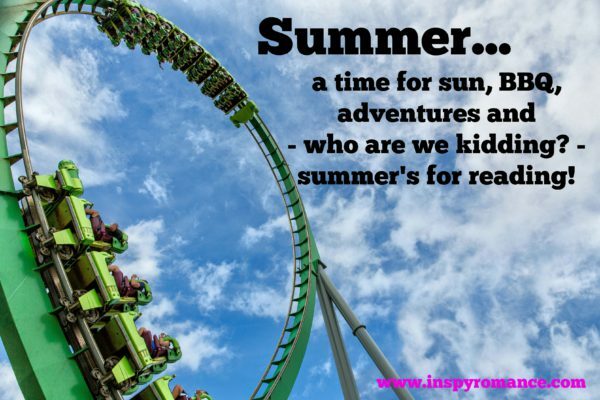 Again (for me) summer reading is all about being transported to somewhere wonderful and the coastal town of Port Providence at center stage in Ethridge’s Hurricane Hope series is the perfect place to virtual-summer. 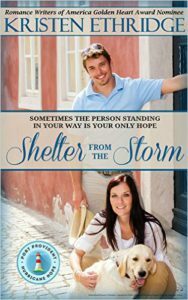 You can start the series with Shelter from the Storm. Sweet romance, handsome guy, and rescue dogs – need I say more? Can I just say, this book is basically amazing? Because that’s how I felt. I whipped through this one and I may or may not have completely fallen for Vadeem, the hero. The story follows an American tourist and a Russian KSB agent and it’s one of the best books I’ve read so far this year. It’s a sweet, contemporary romance with a dash of suspense and a large helping of swoony moments. The best part? It’s FREE right now to download on Amazon. Now I need your help adding books to my summer reading list. What have you read recently? What’s a beloved favorite that you’d recommend? Back in May, we bypassed spring and went straight into summer with high heat and humidity. No matter the season, I always have a huge back log of books in my TBR pile. Thanks for adding to my list with these great recommendations, Jessica. I will die with a huge TBR list. And I think that’s how it should be! So. Many. Books. Lol. Sorry – I should have prefaced my post with “it’s summer on my side of the world!” But you’re right, winter is ideal for reading too (it’s mean … when’s not the perfect time to read?!?). I totally agree that summer means reading time. My whole family used to pack boxes with books before we head out on vacation. I guess I’ve inherited the reading addiction from my parents and when I was old enough we even started getting into each other’s TBR lists, which made for better planning but always nice to talk about stories we’ve all read at one point or another. Of course I have a ton more in my favorite list.. but then don’t we all?! I’ve been eagerly waiting for the release of the box set Whispers of Love as well as Calling Love by Leah Atwood and Abide by Joann Durgin (Love So Divine is also in my TBR list and I will probably get to it pretty quickly, because I really enjoyed Love So Amazing). While I don’t mind the wait too much (I’m really looking forward to the releases), I’m trying to hold off starting new books until I finish preparing classes for a summer course I teach on Tuesdays nights. I will eventually get to all of it (I know it), it’s just that once I start, it’s pretty hard to stop. I agree with Kristen and Belle’s books. I’m reading Belle’s now. Belle’s books are all so good – it was challenging to narrow down my recommendations. I just read “Indivisible” by Kristen Heitzmann. I first discovered her with a free book, “Secrets,” which I really loved!!! I’ve read a lot of hers, and there was only one I didn’t like so far :-) Her romances have a bit more angst in them, and there’s often a bit of psychological suspense. I should add some of those to my list. I love some good angst! Thanks for the shout-out Jess! I’m having a blast writing about Alaska and my lovelorn town called Love. Thanks for this post. It’s given me ideas for summer reading. I love Carol’s cover…the blue is so pretty. And I’ve been reading Kristen’s wonderful stories for a while now. And don’t forget “Small Town Girl”….such a gorgeous cover. Can’t wait to get my hands on that one. So many books, so little time. I adore the town of Love that you created for the series! And congrats on your contract for more Alaskan Groom books. I can’t wait to read them. I hope you enjoy Small-Town Girl! I will try to reduce my TBR pile with too many books to begin to name. That one’s on my TBR pile too! I love that Lord of the Rings is featured in it. I just finished Connie Almony’s One Among Men and I’m also reading the Smoke and Mirrors mystery set. One Among Men was just amazing and the three books I’ve read so far in the Smoke and Mirrors set have been great as well. I also had the opportunity to read an ARC of Shanna Hatfield’s Millie which releases tomorrow! Loved that one, too! Pretty much loved just about everything I’ve read recently. They’ve all been pretty different from each other, but still all great reads! I think you’ve listed some great books! I also don’t like the heat of summer and am waiting for the final release in Belle’s Alaskan series. Can’t wait to sit at the lake with another great book to read. Thanks! I like your style, Jessica! Great recommendations! I have to add Sit, Stay, Love by Dana Mentink to your list for a good dose of dog induced humor. The Aggie’s Inheritance series by Chautona Having is full of faith, family, and fun plus the 4th book releasing later this month. Chapel Springs series by Ane Mulligan is a hoot! I wish I could review and blog books as fast as I read them!